51% said the Bond series is a classic and nothing about it should change. Less than 2 in 5 want to see a Hispanic, Asian, female or gay Bond. Sean Connery, Pierce Brosnan are the most popular Bond actors. With 25 films over nearly six decades, the James Bond franchise has left an indelible mark on popular culture: From holiday movie marathons to a seminal first-person shooter video game, the archetypal debonaire secret agent has captured the imagination of Americans of all ages. A new Morning Consult/Hollywood Reporter survey of 2,086 U.S. adults shows that there’d be plenty of support stateside for Idris Elba putting a new spin on an old classic and becoming the seventh actor in the franchise to play the eponymous action hero. But most Americans who have watched at least some of the series tend to take a conservative view when it comes to modern representations of the Bond character in film. Sixty-three percent of respondents in the Nov. 8-11 survey — conducted days after People magazine named Elba 2018’s sexiest man alive — backed the actor and musician to play Bond on the big screen, compared with 21 percent who opposed the idea. 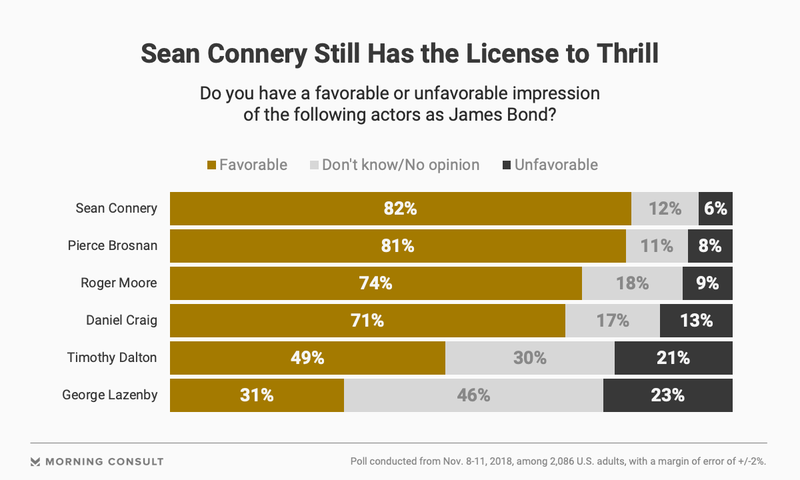 Despite strong support for realizing one of the internet’s favorite popular culture rumors of the past decade, the survey showed most respondents would like to see Ian Fleming’s 007 series remain as canonical as Bond’s famous vodka martini order — shaken, not stirred. Fifty-one percent of adults polled said that the James Bond series was a classic and nothing about it should be changed, a 17-percentage-point edge over those who said they’d prefer to see the film adapt to the times and have a more diverse cast and lead. Pressed on specific examples of potential racial deviations from Fleming’s Anglo-Saxon secret agent, support for a black Bond was the highest at 52 percent. That was followed by 39 percent who said they’d like to see a Hispanic actor in the role and 37 percent who backed an Asian actor. Adults were similarly cool to the concept of a female Bond, with 37 percent voicing support for that option. And even fewer — 28 percent — said they’d support the idea of a gay lead character. The Bond films have held a prominent spot in the cultural zeitgeist for decades, more popular than the “Star Wars” and “Harry Potter” series among Americans as a whole, according to the survey. 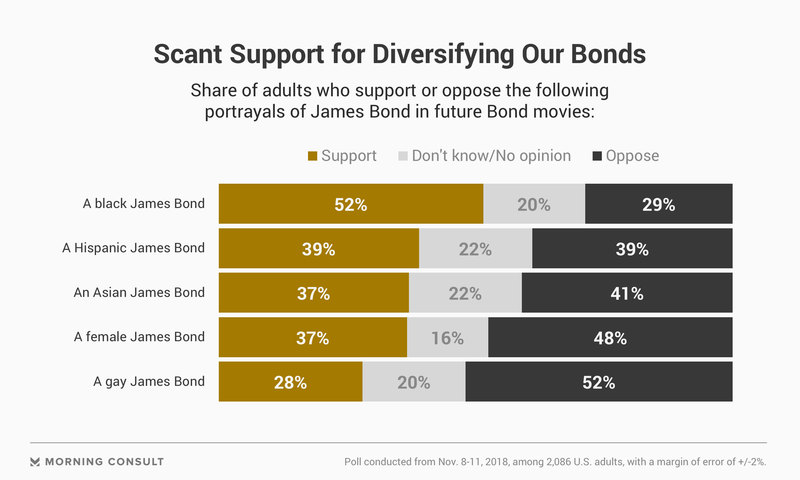 When it comes to actual representations of the Bond character that have made it into film, the public also showed a preference for the old school. Sean Connery, who featured in seven films between 1962 and 1983 and was the first actor to play the MI6 character, scored the highest in terms of favorability with a net rating of 76 points. By comparison, Daniel Craig, the newest Bond lead who is set to begin filming his fifth installment of the series in March, finished third from bottom with a net score of 58 points, only beating out the late ’80s-era Timothy Dalton (28 points) and George Lazenby (8 points), who appeared in just one film — 1969’s “On Her Majesty’s Secret Service” — and did not register with nearly half (46 percent) of the survey’s respondents. While Roger Moore, who also played Bond in seven films, finished near the middle of the pack with a 65-point popularity rating, his movies punched above their weight with the poll’s audience: Four of the 10 most popular Bond films — “Live and Let Die” (1973), “The Man with the Golden Gun” (1974), “The Spy Who Loved Me” (1977) and “For Your Eyes Only” (1981) — featured Moore in the lead role. While Craig was viewed less favorably than his predecessor, Pierce Brosnan (1995-2002), the poll’s respondents did think highly enough of his debut film, 2006’s “Casino Royale,” to earn it a spot in the top 10, placing sixth. Sixty percent said they’d be likely to go see a new Bond film; the next one is set to hit theaters on Valentine’s Day in 2020 with Craig as star and Cary Fukunaga as director.